Samarkand (Uzbek: Samarqand; Persian: سمرقند‎‎; Cyrillic/Russian: Самарканд), alternatively Samarqand or Samarcand, is a city in modern-day Uzbekistan and is one of the oldest inhabited cities in Central Asia. There is evidence of human activity in the area of the city from the late Paleolithic era, though there is no direct evidence of when exactly Samarkand was founded; some theories indicate that it was founded between the 8th and 7th centuries BC. Prospering from its location on the Silk Road between China and the Mediterranean, at times Samarkand was one of the greatest cities of Central Asia. By the time of the Achaemenid Empire of Persia, it was the capital of the Sogdian satrapy. The city was taken by Alexander the Great in 329 BC, when it was known by its Greek name of Marakanda. The city was ruled by a succession of Iranian, Persian, and Turkic peoples until the Mongols under Genghis Khan conquered Samarkand in 1220. Today, Samarkand is the capital of Samarqand Region and Uzbekistan's second largest city. The city is noted for being an Islamic centre for scholarly study. In the 14th century it became the capital of the empire of Timur (Tamerlane) and is the site of his mausoleum (the Gur-e Amir). The Bibi-Khanym Mosque (a modern replica) remains one of the city's most notable landmarks. The Registan was the ancient center of the city. The city has carefully preserved the traditions of ancient crafts: embroidery, gold embroidery, silk weaving, engraving on copper, ceramics, carving and painting on wood. 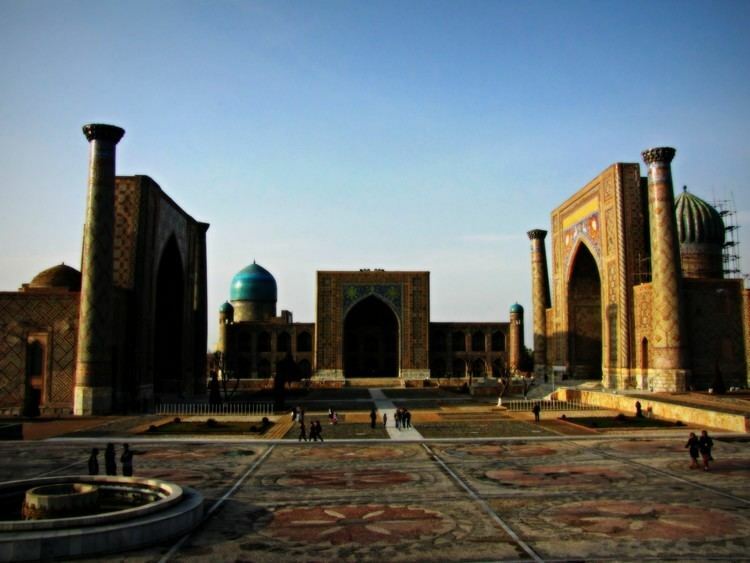 In 2001, UNESCO added the city to its World Heritage List as Samarkand – Crossroads of Cultures. The name probably originates in the Sogdian words asmara, "stone, rock" and kand, "fort, town". Archeological excavations held within the city limits (Syob and midtown) as well as suburban areas (Hojamazgil, Sazag'on) unearthed evidence of human activity as early as 40,000 years old, in the Late Paleolithic era. A group of Mesolithic era (12th-7th millennium BC) archeological sites were discovered at Sazag'on-1, Zamichatosh and Okhalik (suburbs of the city). The Syob and Darg'om canals, supplying the city and its suburbs with water, appeared around the 7th to 5th centuries BC (early Iron Age). There is no direct evidence when Samarkand was founded. Researchers of the Institute of Archeology of Samarkand argue for the existence of the city between the 8th and 7th centuries BC. Alexander the Great conquered Samarkand in 329 BC. The city was known as Maracanda by the Greeks. Written sources offer small clues as to the subsequent system of government. They tell of an Orepius who became ruler "not from ancestors, but as a gift of Alexander". While Samarkand suffered significant damage during Alexander's initial conquest, the city recovered rapidly and under the new Hellenic influence flourished. There were also major new construction techniques; oblong bricks were replaced with square ones and superior methods of masonry and plastering were introduced. Alexander's conquests introduced into Central Asia classical Greek culture; at least for a time the Greek models were followed closely by the local artisans. This Greek legacy continued as the city became part of the various Greek successor states that emerged following Alexander's death: it would become part of the Seleucid Empire, Greco-Bactrian Kingdom, and Kushan Empire, successively. After the Kushan era the city declined; it did not really revive until the 5th century. 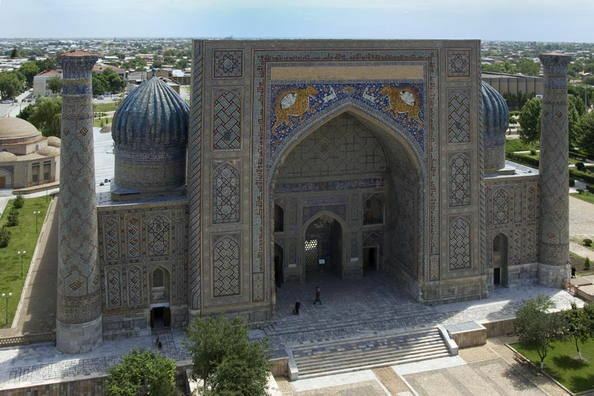 During this period, Samarkand was a diverse religious community and was home to a number of religions, including Buddhism, Zoroastrianism, Hinduism, Manichaeism, Judaism and Nestorian Christianity. However, after the Arab conquest of Sogdiana, Islam became the dominant religion, with much of the population converting. In 1370 the conqueror Timur (Tamerlane), the founder and ruler of the Timurid Empire, made Samarkand his capital. During the next 35 years, he rebuilt most of the city and populated it with the great artisans and craftsmen from across the empire. Timur gained a reputation as a patron of the arts and Samarkand grew to become the centre of the region of Transoxiana. Timur's commitment to the arts is evident in the way he was ruthless with his enemies but merciful towards those with special artistic abilities, sparing the lives of artists, craftmen and architects so that he could bring them to improve and beautify his capital. He was also directly involved in his construction projects and his visions often exceeded the technical abilities of his workers. Furthermore, the city was in a state of constant construction and Timur would often request buildings to be done and redone quickly if he was unsatisfied with the results. Timur made it so that the city could only be reached by roads and also ordered the construction of deep ditches and walls, that would run five miles (8.0 km) in circumference, separating the city from the rest of its surrounding neighbors. 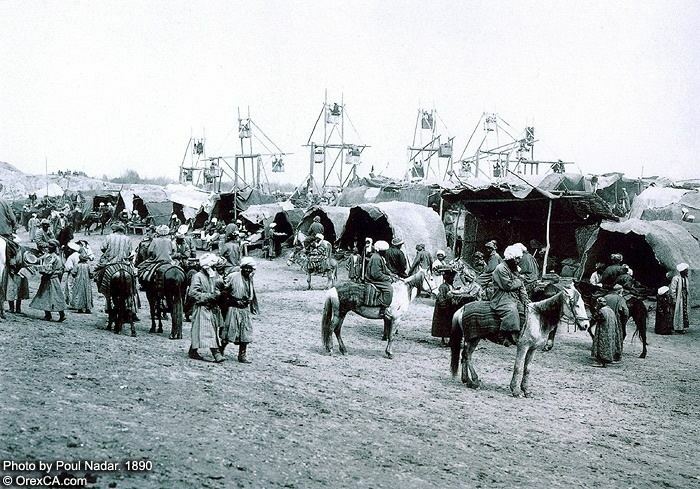 During this time the city had a population of about 150,000. This great period of reconstruction is encapsulated in the account of Henry III's ambassador, Ruy Gonzalez de Clavijo, who was stationed there between 1403 and 1406. During his stay the city was typically in a constant state of construction. "The Mosque which Timur had caused to be built in memory of the mother of his wife...seemed to us the noblest of all those we visited in the city of Samarkand, but no sooner had it been completed than he begun to find fault with its entrance gateway, which he now said was much too low and must forthwith be pulled down." Historically, Samarkand was a diverse religious community. Since the 8th century when the Arabs entered Central Asia, Islam has become the main religion. According to some sources, approximately 90% of people are Sunni while Shia Islam, Christianity and Judaism are minor religions. Even though 90% of the population of Uzbekistan are Sunni Muslim, Islam is not followed strictly. Visitors state that in style of dress and attitude to religion people of Samarkand are becoming more westernized rather than keeping their ancestors' tradition and culture. In spite of following Islam, many Sunni Muslims in Samarkand drink alcohol especially during weddings, holidays and birthdays. In addition, there are 14 small wine manufacturers in Uzbekistan, with one of the oldest and famous being in Samarkand. People have habit of drinking vodka to celebrate good days with their relatives, friends, and neighbors. There are Shia towns in Samarkand where Shia Muslims are composed almost entirely of ethnic-Iranians. They have their own mosques and mausoleums. The role of Christianity is diminishing as many Christians have been leaving the city. Christians include: Russians, Koreans, Ukrainians and Armenians. Only a few churches now hold services. Giovanni = John (1359? – ?). Sher-Dor Madrasah (Lions Gate) (1619–1635/36). Timur initiated the building of Bibi Khanum after his campaign in India in 1398-1399. Before its reconstruction after an earthquake in 1897, Bibi Khanum had around 450 marble columns that were established with the help of 95 elephants that Timur had brought back from Hindustan. Also from India, artisans and stonemasons designed the mosque's dome, giving it its distinctiveness amongst the other buildings. The ornaments and decorations of the walls include floral and vegetal symbols which are used to signify gardens. Gardens are commonly interpreted as paradise in the Islamic religion and they were both inscribed in tomb walls and grown in the city itself. In the city of Samarkand, there were two major gardens, the New Garden and the Garden of Heart's Delight, and these became the central areas of entertainment for ambassadors and important guests. A friend of Genghis Khan in 1218 named Yelü Chucai, reported that Samarkand was the most beautiful city of all where "it was surrounded by numerous gardens. Every household had a garden, and all the gardens were well designed, with canals and water fountains that supplied water to round or square-shaped ponds. The landscape included rows of willows and cypress trees, and peach and plum orchards were shoulder to shoulder." The floors of the mausoleum is entirely covered with uninterrupted patterns of tiles of flowers, emphasizing the presence of Islam and Islamic art in the city. In addition, Persian carpets with floral printings have been found in some of the Timurid buildings. There is evidence that Timur tried to preserve his Mongol roots. In the chamber in which his body was laid, "tuqs" were found - those are poles with horses' tails hanging at the top, which was symbolic of an ancient Turkic tradition where horses, which were valuable commodities, were sacrificed in order to honor the dead, and a cavalry standard type shared by many nomads, up to the Ottoman Turks.